Caterina Rosetta has got some big time choices to make in her life but her options are limited. She’s had a daughter out of wedlock with a man who she thinks has abandoned her….and since it’s the 1950’s, having a child out of wedlock basically means social suicide. She hasn’t told her mother about the baby because she knows her mother will basically disown her so she needs to give the baby up for adoption…..but she can’t bring herself to do that either. Her mother basically raised her all on her own, so why can’t she raise her daughter by herself? Caterina is an accomplished sommelier who has grown up in a family of winemakers. She is sure she can support herself in some way. On a fateful trip to visit her mother, she confesses that she has a child and after a row between the two, Caterina is not sure what to do about her situation. Then a man shows up at the vineyard looking for Caterina. This man is an investigator who has been hired by a family in Italy to find Caterine and inform her that her long lost grandmother has left her an estate in Italy complete with a vineyard. Caterine knows little to nothing about her father’s side of the family as he died when she was young so she jumps at the chance not only to have some independence but to discover more about her family. When her mother finds out she tries to stop Caterina from making a huge mistake by going to Italy. But with Caterina’s mind made up, her mother has little choice however she warns Caterina that she will only find heartbreak and pain in Italy. Clearly Caterina’s mother is keeping something from her…..something big…..but Caterina would rather not press the issue and goes to Italy anyway to discover what the secrets are. What Caterina finds is a tangled web of small town gossip, family lies, and tragic circumstances and she is left with more questions than answers. I’ve read Jan Moran’s other novel and was completely blown away by her depth of characters, detailed plots, and elegant romance. So when this book came up, I interestingly enough has mixed feelings about reviewing it. On one hand I know the caliber of her writing and how well she does romance……however this sounded more like a family saga so I wasn’t sure what to expect. Ultimately I decided to review it because I know how well she writes. I was NOT disappointed! I read this book in like 2 days. Even though it was 350+ pages, it read so quick and didn’t feel slow in any part. What I found most interesting about this novel was the whole wine part. 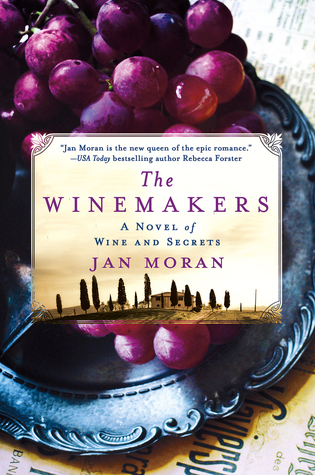 I do not drink wine and I have zero knowledge about the wine industry…..nor did I really have any interest in it but this novel made wine sound so beautiful and romantic. I instantly wanted to learn more about wine and how it was made etc. I’ve even started researching wine tastings in my area and in Napa Valley thanks to this book! It sounds so wonderful and interesting so I’ve become inspired to try out the whole wine tasting thing and see if I can expand my knowledge on a topic! Besides the wine part, this novel was filled with intriguing family secrets, some romance, and a balanced two time period novel. The novel alternates between Caterina’s 1950’s story and her mother’s 1920’s story but one didn’t eclipse the other which I loved. Caterina was still the focus of the novel and I enjoyed her as a character immensely. She was strong but not annoyingly so, and there was room for her character to grow throughout the story. I loved watching her romance and her story unfold. The only criticism I had was about the ending. I felt like there was all this build up to the ending and then it simply came together without the drama and resolution that the situation demanded. I don’t want to ruin it for anyone so that’s all I say about the ending. I basically felt like it wrapped up a little too neatly and too fast and then the novel was over so I just felt like the conclusion could have been a little more structured. Overall this was a wonderful novel about family secrets, lies, romance, and wine! You don’t have to love wine to appreciate this novel but it certainly does help! It seems a very ordinary plot, I don´t know if I want to read the book. It reminds me a movie I watched years ago.